Hakusan, Japan, September 6, 2016 – EIZO Corporation (TSE: 6737) today announced the new ColorEdge CG2730 and CS2730, two 27-inch monitors for professionals and aspiring creatives in varying fields. The spacious 27-inch screens of these monitors have a native resolution of 2560 x 1440, which offers a pixel count of double that of 1280 x 1024 and 60% more than 1920 x 1200 resolutions. This gives creatives ample space to work with images, tool palettes, and other windows. The ColorEdge CG2730 and CS2730 feature a sleek new cabinet design. The bottom bezel of both monitors is approximately 46% slimmer and monitor depth is approximately 30% thinner compared to the previous model. The monitors’ weight was also reduced by 30% to just 8.9 kg, which when combined with the built-in carrying handle makes them easy to move to various locations or within the studio. The flat design uses electrostatic switches on the front bezel in place of traditional buttons for seamless access to monitor settings. The switches light up using an LED for viewing in dimly-lit work environments. The ColorEdge CG2730 is the professional-level model for use in photography, design, print, and post production. It features a built-in self-calibration sensor for hassle-free monitor maintenance that ensures optimal color reproduction and image consistency throughout the creative workflow. The ColorEdge CS2730 includes many of the advanced features of EIZO’s ColorEdge lineup while meeting the varying needs and budgets of hobbyists and prosumers that want to create, edit, and enjoy photography, illustration, and more. Both the ColorEdge CG2730 and CS2730 feature an IPS (in-plane-switching) panel with a wide gamut that ensures 99% Adobe RGB coverage so photos of vibrant blues and lush greens are reproduced faithfully. The ColorEdge CG2730’s panel also covers 98% of the DCI-P3 color space used in post-production as well as features a high contrast ratio of 1500:11 for producing true blacks. It is also equipped with a retardation film which allows dark tones to retain their depth even when viewed from an angle. Both monitors are equipped with EIZO’s unique digital uniformity equalizer technology (DUE) that ensures a Delta-E difference of 3 or less across the screen. This provides users with stable image display for color-critical work. EIZO will be showing the ColorEdge CG2730 and CS2730 at Photokina 2016 in Cologne, Germany from September 20 – 25. Visit Hall 4.1, Booth J011, K014 to see the products. 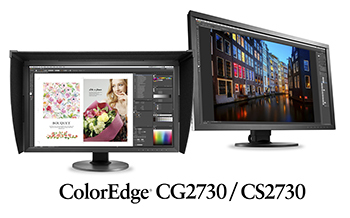 The ColorEdge CG2730 and CS2730 are now shipping. Date of availability varies by country so contact the EIZO group company or distributor in your country for details. 4 Monitor must be used within the recommended brightness of 120 cd/m2 or less and the color temperature between 5000 – 6500 K.